Guild Tech is one of the most important elements of the game. It allows you to strengthen all your heroes in all the activities in the game. Idle Heroes Strategy Game Guide. Guild Tech is one of the most important elements of the game. It allows you to strengthen all your heroes in all the activities in the game. The bonuses that you set in Guild Tech will work in any fight you face in Idle Heroes and these are very significant bonuses. You should try to earn as many Guild Coins as you can and all you earned Guild Coins spend in Guild Tech until you raise the necessary bonuses to the maximum. 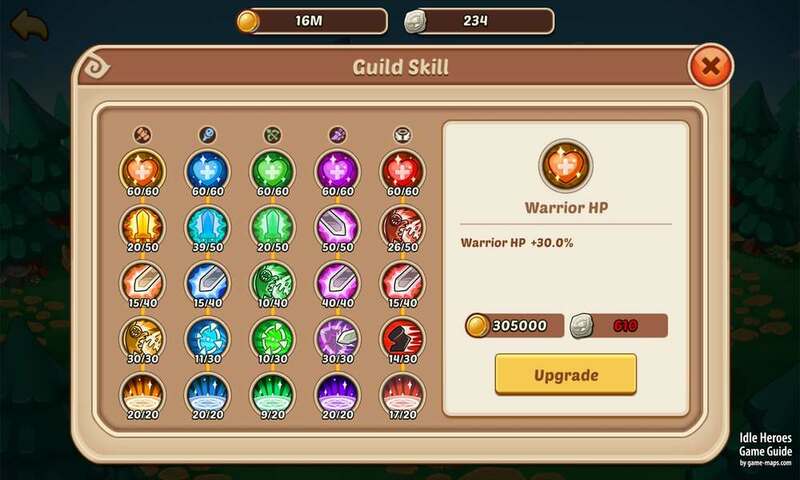 Guild Techs are independent of the guild you belong to, if you change the guild all the bonuses will remain, you just have to log out and log in again. There are five groups of bonuses, one for each character class Warrior, Mage, Ranger, Assassin and Priest. If you for example do not want to play Ranger class ever, you can abandon developing Ranger bonuses. But the truth is that it is reasonable to develop all the bonuses. The bonuses that you develop will apply to all your heroes that belong to a particular class.